Installing and activating the Premium add-on is much like installing and activating any other WordPress plugin. Since MailChimp for WordPress Premium depends on the free MailChimp for WordPress plugin, please make sure you have that plugin installed and activated first. After registering for a Premium account you should be able to log in to our account area right away. From there, you can manage your plugin license and download the Premium plugin. Download the .zip file to your computer and login to your WordPress admin panel. It is not required extract the .zip file. Note for Safari for Mac users for which the .zip file automatically extracts after downloading: go to Preferences > General in your browser settings and uncheck “open safe files after downloading” or use Finder to re-compress the files to a .zip again. Then, go to “Plugins > Add New” and click on the “Upload Plugin” link at the top of the screen. You’ll be presented with the following screen where can you browse your computer for the .zip file you just downloaded. Press “Install now” and the MailChimp for WordPress Premium plugin will be installed. After successfully installing the plugin, click “Activate plugin“ to activate the plugin. That's it, you now have access to the Premium features of MailChimp for WordPress. Hooray! 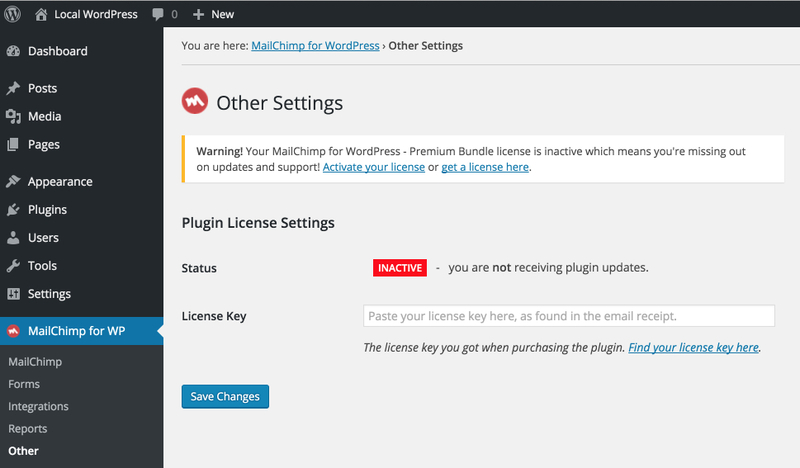 If you want to receive plugin updates for MailChimp for WordPress Premium then you will need to activate the license key you received right after purchasing the plugin. To do that, go to WP Admin > MailChimp for WP > Other and locate the "Plugin License Settings" section. Copy your license key from the purchase receipt, paste it in the license key field and click the “Save Changes“ button. In most cases, the plugin will detect the new license key and automatically activate it. If not, click the “Activate License” button to activate your license. The plugin is now installed & configured to receive plugin updates. You're all set to grow your lists!